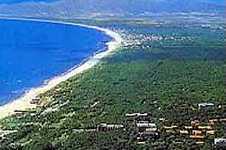 Set between the blue sea of the Etruscan Coast and the green Tuscan country, Cecina and its sea-coast are locations loved by tourists from all over the world. Thanks to its strategic position it is an ideal place to spend a relaxing holiday by the sea and to discover the charming inland of Tuscany, rich in history, art and traditions. 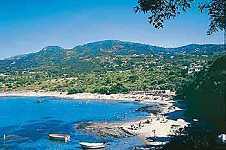 Bibbona, Bolgheri, Castagneto Carducci and Castiglioncello can be reached in a few minutes by car. The most important artistic and cultural cities such as Pisa, Florence, Volterra and Siena are easily reached. A thick sea pine wood stretching for 15 kilometres along the coast is ideal for a horse or a bicycle ride. At Marina di Cecina, where the sea is clean and accessible, it is possible to play numerous sports, walk in the pine wood, spend days full of fun and relaxation in all the seasons. All sport facilities are located within a short distance from the centre: tennis courts, five-a-side, athletic tracks, sailing, diver centres, riding school, minigolf and swimming-pools. However, Cecina does not only offer tourists its vicinity to the sea, but it is a place full in history and culture, as the Etruscan and Roman remains on show in the Guerrazzi Museum and the settlements in the Villa di San Vincenzino testify. The tradition of welcoming people and a hospitality culture (not by chance, the important European Exchange of Associated Tourism takes place in Cecina every year) contribute to the fact that the accommodation facilities are very well equipped with a qualified service. The choice of food is of a very high quality and cultural life is full of events all year around. Last but not least, the charming tourist port and the renown night clubs make this welcoming and pleasant location suitable to everyones taste, both for a family holiday or a holiday with friends.